Today's systems and networks rely on new technologies like reconfigurable add-drop multiplexer (ROADM), and transmit at speeds reaching 40G and 100G. In such a challenging technological environment, getting reliable in-band OSNR values is key—which is exactly what the IQS-5240S/BP provides, thanks to EXFO's polarization-resolved optical spectrum (PROS) OSNR measurement approach. The IEC subsystem test procedure 61280-2-9 defines OSNR measurement as the power ratio between the peak power and the noise at half the distance between the peaks. Using this method, as shown in figure 1, the noise level at the channel (or peak power) wavelength is interpolated from the noise level between the channels. However, in ROADM or 40 Gbit/s systems, this method may lead to incorrect results since the noise level between the peaks is no longer directly correlated with the noise level at the channel wavelength. For instance, Figure 3 displays closely spaced 40G signals that require in-band OSNR measurement, since the power level between channels is higher than the actual noise due to channel overlap. The built-in polarization-resolved optical spectrum method of EXFO's IQS-5240S-P and IQS-5240BP OSAs enables you to achieve accurate in-band OSNR measurements of a ROADM or 40 Gbit/s system directly and automatically. With 33 pm (or ~4.5 GHz) resolution bandwidth defined as the FWHM of the OSA filter shape, the instrument can analyze all densely spaced signals, including important 50 GHz ITU-grid WDM signals, high-speed modulated lasers/emitters and DWDM passive components—all critical in today's networks. Combined with a very sharp rejection ratio (-35 dBc at 0.1 nm), the optical signal-to-noise ratio (OSNR) and modulated band profile can be measured with high accuracy. To ensure accurate noise and broad signal power measurements, the noise equivalent bandwidth (NEB) of the OSA is calibrated at many points from 950 nm to 1650 nm. The all-new IQS-5240S and IQS-5240BP Optical Spectrum Analyzer (OSA) series covers your DWDM applications and all channel spacings, from 50 GHz DWDM to CWDM. This is what we call "no-compromise performance", whatever your network specificities and testing requirements. 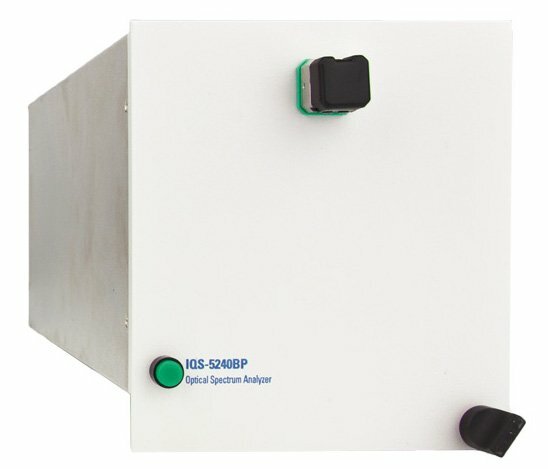 Thanks to the IQS-600 platforms's Windows-based, open architecture and Ethernet connectivity, the IQS-5240S/BP OSA test modules can easily be controlled remotely using SCPI commands and LabVIEW drivers, or any other automation software.